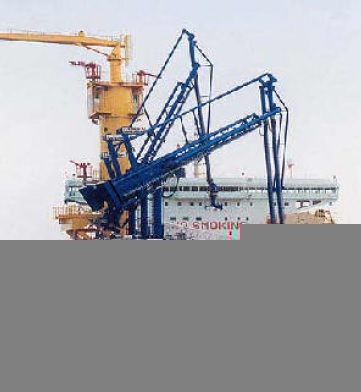 Liquid cargo is nowadays usually transferred using an articulated arm loading/discharge systems, and groups of arms are often found on a shore refineries or on offshore loading facilities. It connects to the tanker’s manifold usually located near the centre of the ship. Before commencing fuel oil transfer operation, chief engineer shall post cargo information as described . A line diagram of the vessel’s oil transfer piping including the location of each valve, pump, control device, vent and overflow. The location of the shut-off valve or other isolation devices that separate all bilge or ballast system from the oil transfer system. Cargo piping in tankers is usually mild steel and is protected from rusting by external painting. Most large oil tankers have a ring main system that allows increased operational flexibility but with the penalty of reduced segregation. Tankers fitted with deep-well pumps in cargo tanks have dedicated piping. Each tank will have its own pump, pipe and cargo manifold. Stainless steel piping is invariably used with stainless steel tanks. On chemical tankers, cargo pipes must be joined by welding. Flanged connections are allowed on oil tankers, as well as on chemical tankers at valve connections and for fitting portable spool pieces, which are removable short lengths of pipe used for segregation of piping. Regular pressure testing of cargo pipes is essential to detect weak points before they fail. Driving cargo and ballast pumps and for many other minor shipboard utilities. It is a requirement that hydraulic systems for steering, pitch control and watertight doors have dedicated piping and pumps. Some hydraulic fluids are highly flammable. As a result, hydraulic equipment and pipework must be kept clear of hot surfaces. Alternatively, hot surfaces must be protected by spray shields. It is important to prevent the external corrosion of hydraulic piping located on deck. Hydraulic pipes operate at very high pressure and corrosion-induced weakness frequently causes hydraulic pipes to burst. A high standard of cleanliness is necessary when working with, or replacing, hydraulic piping. Check the systems regularly for leaks, corrosion or mechanical damage. Use only good-quality and clean hydraulic fluid. Oil discharge containment and procedures for emptying the oil containment. The oil discharge containment is a metal box welded to the deck under or around each fuel oil, bulk lubricating oil tank vent, overflow, and filling pipe in accordance with 33CFR155.320. Drop the oil into fuel oil tank using the by-pass valve or transfer into the fuel oil tank by other methods. Vessels fitted with equipment for monitoring the discharge of effluent from slop tanks must ensure that this equipment is operational before any discharge is made. The operation of this equipment must be in accordance with the approved “Oil Discharge Monitoring and Control Systems Operation Manual”. The ODME shall be calibrated in accordance with the manufacturer's recommendations as necessary to conform to manufacturer’s specifications, but in no case shall the interval between calibrations exceed 5 years. The ODME shall be self-tested before each use. A test according to the manufacturer’s manual is to be carried out at intervals not exceeding one month. Printed records from the monitoring equipment must be retained on board for inspection by surveyors. More than two crew members (at least one engineer) shall be on duty to conduct the oil transfer operation.Each crewmember engaging in the oil transfer operation shall familiarize himself with the line diagram of the piping, valves, tanks and etc. Chief engineer shall inspect each equipment and confirm them normal condition and give adequate instructions to the person in charge. The person in charge shall aid the chief engineer and operate valves and check ullage. Engine hands shall engage in oil transfer operation under the command of chief engineer and the person in charge. The person in charge of oil transfer shall assure that the vessel is securely moored and the moorings are being tended as necessary through consultation with the deck officer on duty. Each deckhand on duty shall watch ship mooring and report to officer on duty and operate the mooring winch, if necessary. Environmental and operating conditions will vary from terminal to terminal and working practices are developed accordingly. When operating at a SBM, CBM or a terminal utilising tandem mooring the terminals operational requirements shall be carefully reviewed and strictly complied with. Any abnormal condition shall be immediately reported to the Loading / Mooring Master as appropriate. Environmental conditions – wind / sea / swell conditions and currents / tidal streams (as appropriate) shall be monitored throughout and appropriate actions taken as agreed with the terminal in the event of unexpected changes or operating conditions deterorating to close to operating limits. Weather forecasts shall be obtained from all available sources. In all cases the hose string shall be carefully monitored for product leakage. If the terminal hoses / lines are to be flushed with seawater on completion of operations this should be properly addressed. When charging fuel oil from shore facility or barge, the emergency shutdown must be provided by the transferring facility. When transferring fuel oil by ship’s pump, engineer in charge shall operate the emergency shutdown button. When topping off tanks, engineer in charge shall check ullage continuously and request the shore personnel to reduce the loading rate if necessary to avoid the possibility of oil spill. Chief engineer shall discuss with shore personnel about communications during transfer operation. Communications require that continuous two-way voice communications be possible at all times, ex. walkie-talkie. Chief engineer shall ensure that all valves used during the oil transfer operation are closed after completion of the transfer. No person shall open the abovementioned openings without permission of the chief engineer.